We study game equilibria in a model of production and externalities in network with two types of agents who possess different productivities. Each agent may invest a part of her endowment (for instance, time or money) at the first stage; consumption at the second period depends on her own investment and productivity as well as on the investments of her neighbors in the network. Three ways of agent’s behavior are possible: passive (no investment), active (a part of endowment is invested) and hyperactive (the whole endowment is invested). We introduce adjustment dynamics and study consequences of junction of two regular networks with different productivities of agents. In particular, we study how the behavior of nonadopters (passive agents) changes when they connect to adopters (active or hyperactive) agents. The research is supported by the Russian Foundation for Basic Research (project 17-06-00618). 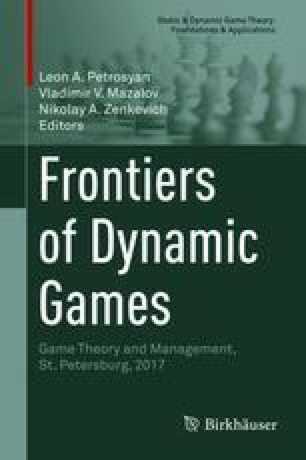 The authors are grateful to two anonymous referees for valuable comments.